Extremely dry facial skin can be frustrating and painful. If someone is at the same time sensitive to a variety of skin care products, then it is difficult to solve the problem. Visiting a salon for a facial treatment can soothe the skin, but it is often expensive and time consuming. Fortunately, there are a wide variety of face masks to make at home to treat dry and nourish skin. We selected 8 of the best recipes that are easy to make at home. Honey is an excellent home remedy for dry skin because it nourishes the skin and helps to reduce wrinkles. However, you should avoid facial masks with honey if you have red veins on your face because it could worsen their condition. Avocado is another excellent remedy for dry facial skin. Avocados contain a variety of minerals and antioxidants that help to maintain the skin. Half an avocado mix with 1/4 cup honey until it becomes creamy. Wash the face with a mild detergent and apply this mixture directly to the face with the hands. Leave the mask on for at least 10 to 20 minutes, then rinse with warm water. Apply moisturizing cream. 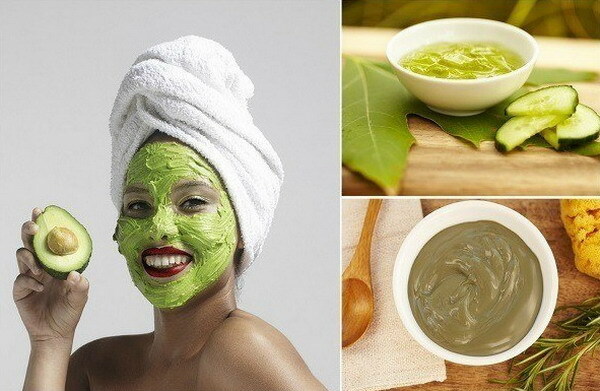 For a fast and easy avocado facial mask, simply purge an avocado and add a few drops of almond oil. Apply this mixture to the face and leave as long as possible, then rinse with cold water. Half a cup of plain yogurt with 1 tbsp honey. Once these two are combined, crush 1/4 of a ripe banana and add. Apply the thick paste to the face and neck. Leave to work for 10 minutes, then rinse with cold water. Combine egg yolk with 1 tbsp warm vegetable oil. In another bowl, mix 1/2 tsp water with 1/2 tsp lemon juice. Add this mixture slowly to the egg yolk-vegetable oil mix. Apply 3 layers with a clean make-up brush to the face and neck after each layer. Leave on for 10 to 15 minutes, then rinse with warm water, followed by rinsing with cold water. Use this mask twice a week for four to six weeks. Put the egg whites from an egg into a small bowl, and stir until it starts to thicken easily. Add 1 teaspoon honey and 1 teaspoon of sunflower oil and mix well. Apply the mixture to the face and let it act for 15 minutes. Rinse with warm water. 2 bananas, 1 tablespoon of honey and 1/2 cup of yogurt in a blender. Mix the ingredients until a creamy paste is formed. Apply on face, leave to act for 20 minutes or until it dries. Rinse with warm water. Peel the cucumber and remove the seeds. Cut the cucumber into small pieces, place in a kitchen machine with 2 tablespoons of aloe vera. Mix until the mixture becomes a smooth paste. Apply to the face and leave for 30 minutes. Wash the mask with cold water. Remove the skin from a mango and cut it into small pieces. Add 1 tablespoon of unsalted butter, 1 egg yolk, 1/2 teaspoon camomile oil and 1/2 teaspoon of apricot oil to a blender and mix until a smooth paste is formed. Leave the mixture on the face for 10 to 15 minutes. 2 tablespoons white clay kaolin, 1 tablespoon cornmeal, 1 tablespoon wheatgrass oil and 1 tablespoon apricot oil in a small bowl. Mix all the ingredients together with sufficient water until a creamy substance is formed. Apply the mixture to the face and leave for 15 to 20 minutes. Then wash with warm water. Wash face with cold water to finish the effect. Apply a moisturizer to seal the moisture in the skin.